Classic text leads from elementary calculus into more theoretic problems. Precise approach with definitions, theorems, proofs, examples and exercises. Topics include partial differentiation, vectors, differential geometry, Stieltjes integral, infinite series, gamma function, Fourier series, Laplace transform, much more. Numerous graded exercises with selected answers. 1961 edition. 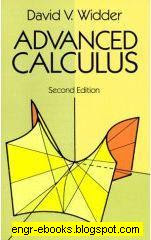 I bought this textbook as a supplementary resource book for an advanced calculus class I once took although I ended up using it for a Differential Equations II class instead (in particular the partial differential equation and fourier series sections). This book does not present proofs as one might expect from many of today's Advanced Calculus classes. It does not presentabstract theorems but rather applied Calculus and Differential Equations. You will not find logical connectives, quantifiers, techniques of proofs, set operations, induction, or completeness axioms in this book. What you will find is partial differentiation, line and surface integrals, definite integrals, fourier series, infinite series, etc. Electrical and Computer Engineers will find that they may benefit from the Vector, Fourier Series, and Laplace Transform chaptersof this book. Physics majors are more likely to profit from the chapters on Partial Differentiation and Fourier Series.Here's the textbook's chapter titles: 1) Partial Differentiation, 2) Vectors, 3) Differential Geometry', 4) Applications of Partial Differentation, 5) Stieltjes Integral, 6) Multiple Integrals, 7) Line and Surface Integrals, 8) Limits and Indeterminate Forms, 9) Infinite Series, 10) Convergence of Improper Integrals, 11) The Gamma Function. Evaluation of Definite Integrals, 12) Fourier Series, 13) The Laplace Transform, 14) Applications of the Laplace Transform.